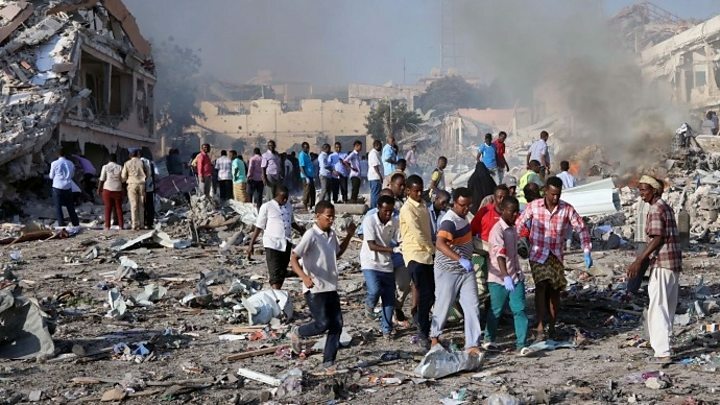 Somalia is appealing for blood to treat those wounded in Saturday's huge truck bombing in the capital, Mogadishu, which killed at least 281 people. 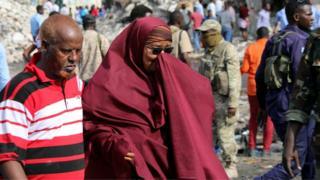 Information Minister Abdirahman Osman told the BBC the death toll was likely to rise, and more help was needed. He said more than 300 people had been injured in Somalia's deadliest terror attack in 10 years, and more bodies were trapped under rubble. Two planes of medial aid - from the US and Qatar - have landed in the capital. Turkey and Djibouti sent humanitarian assistance on Monday - and a Turkish military plane has taken 40 of the injured to Turkey for medical treatment. Neighbouring Kenya also plans to airlift some of the victims for further treatment, and in the Kenyan capital, Nairobi, hundreds of people been donating blood. Young and old residents alike have been queuing here in Eastleigh, known as Nairobi's "Little Mogadishu, to give blood since the early in the morning. This tragedy feels personal for the thousands of Somalis who have settled in the neighbourhood since fleeing the conflict in their home country. Konsar Mohamed, 20, told me she lost a friend in the attack. "It hurts a lot. We used to laugh a lot... I want to tell him 'rest in peace my brother.'" She says has donated blood because "this is the biggest gift I can give to my people". Mr Osman blamed the Islamist al-Shabab group, which is allied to al-Qaeda, for the attack. The minister thanked the hundreds of Mogadishu residents who had already donated blood. Somalia does not have a blood bank, which was hampering some of the aid efforts, he told the Reuters news agency. On Monday, 165 unidentified bodies were buried by the authorities. There were burnt beyond recognition and there was no means of identifying them. A youth group, with the help of the government, has started a social media campaign to raise money for the families of the victims and organise blood donations for the injured. Why does al-Shabab target hotels? Of those who were identified, one of the victims was a medical student due to graduate the next day. Maryam Abdullahi's father had flown to Mogadishu to attend her graduation but instead witnessed her burial. The truck exploded at a busy junction, destroying hotels, government offices and restaurants. A 22,000-strong African Union force is in the country trying to help the government recapture territory from al-Shabab, whose fighters are active in much of rural southern Somalia. Mr Osman said the UN-backed government had been calling for an easing of an arms embargo on Somalia for years. "Our security forces are not enabled to carry out sophisticated security operations that will stop such attacks," he told the BBC's Newsday programme.